John Glenn holds the singular distinction of being the first American to orbit the Earth. Moreover, John Glenn was an accomplished fighter pilot during World War II and the Korean Conflict, a test pilot, astronaut, and a United States Senator representing his home state of Ohio. 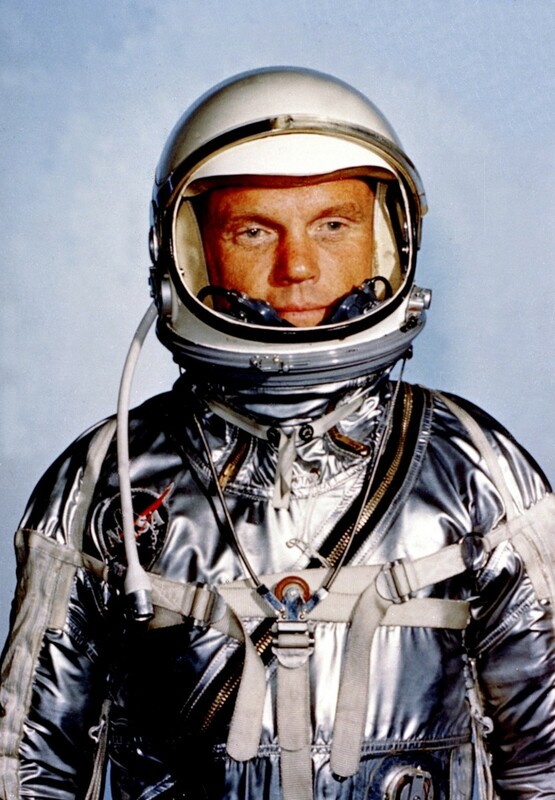 Astronaut John H. Glenn Jr. in his Mercury 6 spacesuit. 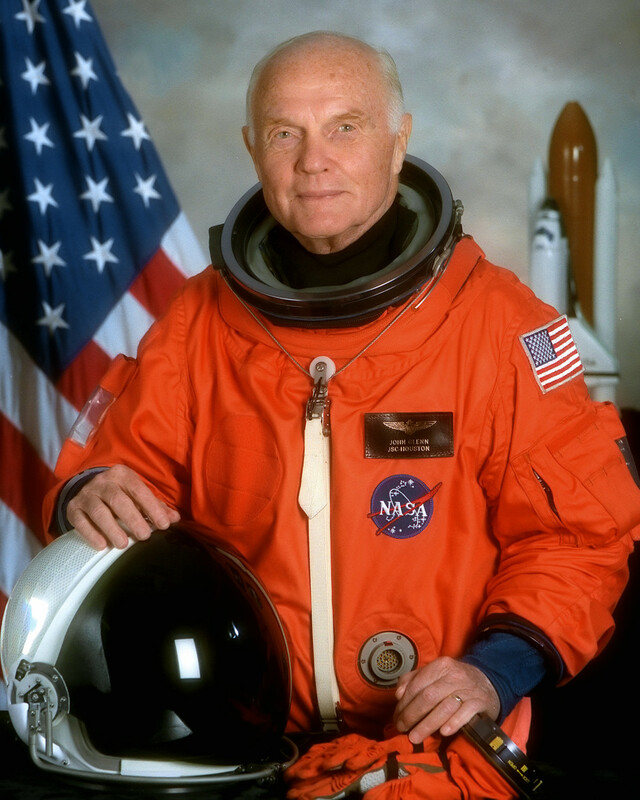 John Herschel Glenn Jr. was born in Cambridge, Ohio on July 28th, 1921. His father owned a plumbing company and his mother Clara was a school teacher. He was raised in Concord, Ohio alongside his adopted sister Jean. Following his graduation from New Concord High School in 1939, he studied Engineering at Muskingum College. He earned a private pilot license for credit in a physics course in 1941.Glenn did not complete his senior year in residence or take a proficiency exam, both requirements of the school for the Bachelor of Science degree. The school granted Glenn his degree in 1962, after his Mercury space flight. Glenn had quit college after the Japanese attack on Pearl Harbor to enlist in the Army Air Corps. Having never been called to duty, in 1942 Glenn entered the Naval Aviation Cadet Program and was commissioned as an officer in the United States Marine Corp in 1943 after advanced air combat training; he joined Marine Fighter Squadron 155 and spent a year flying F-4U fighters in the Marshall Islands. He flew 59 combat missions against the Japanese during Second World War. After the war, he was a member of Marine Fighter Squadron 218 on the North China patrol and served on Guam. From June 1948 to December 1950, he served as an instructor in advanced flight training at Corpus Christi, Texas. He then attended Amphibious Warfare Training at Quantico, Virginia. In Korea, he flew 63 missions with Marine Fighter Squadron 311. 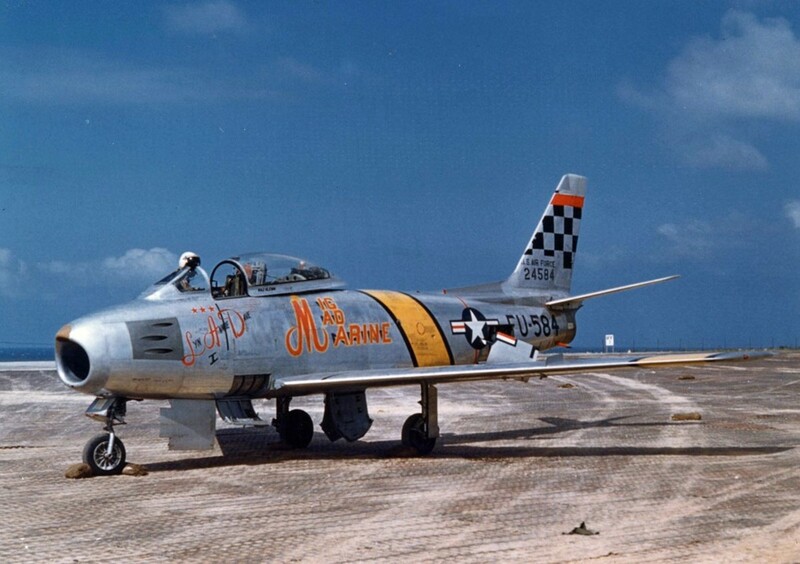 As an exchange pilot with the Air Force Glenn flew 27 missions in the F-86 Sabre. In the last nine days of fighting in Korea, Glenn shot down three Soviet MiG warplanes in combat along the Yalu River. Glenn was awarded the Distinguished Flying Cross on six occasions, and holds the Air Medal with 18 Clusters for his service during World War II and Korea. Glenn also received the Navy Unit Commendation for service in Korea, the Asiatic-Pacific Campaign Medal, the American Campaign Medal, the World War II Victory Medal, the China Service Medal, the National Defense Service Medal, the Korean Service Medal, the United Nations Service Medal, the Korean Presidential Unit Citation, the Navy's astronaut Wings, the Marine Corps' Astronaut Medal, the NASA Distinguished Service Medal, and the Congressional Space Medal of Honor. Glenn's USAF F-86F aircraft during the Korean War in 1953. 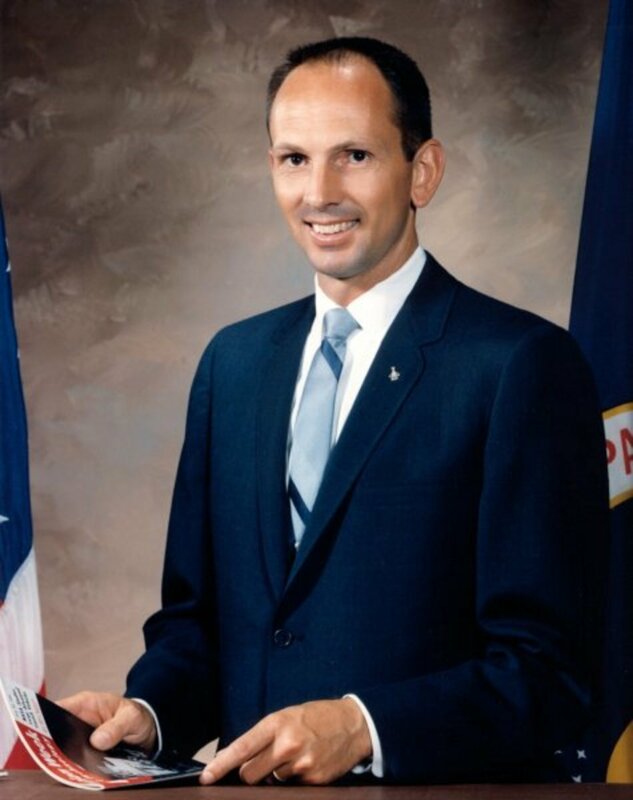 Glenn’s first steps toward becoming an astronaut occurred when he attended Test Pilot School at the Naval Air Test Center in Patuxent River, Maryland. After graduation, he was project officer on several aircraft. He was assigned to the Fighter Design Branch of the Navy Bureau of Aeronautics (now Bureau of Naval Weapons) in Washington from November 1956 to April 1959. During that time, he also attended the University of Maryland. In July 1957, while he was project officer for the F-8U Crusader, he set a transcontinental speed record from Los Angeles to New York making the trip in an impressive 3 hours and 23 minutes. It was the first transcontinental flight to average supersonic speed. Glenn barely met the requirements for America’s infant space program as he was near the age cut off of 40 and lacked a science oriented degree at the time. After a battery of physical and mental evaluations Glenn found himself one of the 32 out of 100 men left on NASA’s list for Mercury astronauts. Following his selection into NASA’s space program Glenn was assigned to the NASA Space Task Group at Langley, Virginia in April of 1959. The Space Task Group was later moved to Houston and became part of the NASA Manned Spacecraft Center (now Johnson Space Center in Houston) in 1962. Before his 4-hour, 55-minute flight in the Friendship 7 capsule, Glenn had served as backup pilot for astronauts Alan Shepard, the first American in space who flew on May 5, 1961, and to Virgil "Gus" Grissom, who followed Shepard on a suborbital flight of his own. Astronauts in the Mercury program were assigned to provide pilot input for the design and development of American spacecraft along with their normal training for the intellectual, physical, and mental rigors of space flight. Glenn specialized in cockpit layout and control functioning, including some of the early designs for the Apollo moon-shot program. Glenn’s famed Mercury flight occurred on February 20, 1962; launched for Cape Canaveral in Florida. On the day of his flight there were no less than eleven launch delays due to equipment malfunctions and the weather. 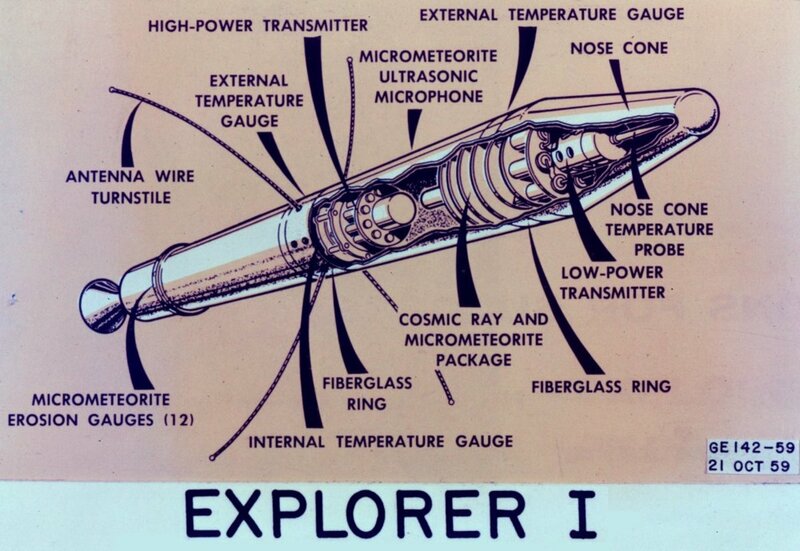 Toward the end of the scheduled 30-minute flight, indications pointed to his heat shield coming loose and there was a real possibility his Mercury capsule would burn up on re-entry. Flight controllers had him modify his re-entry procedure by keeping his retrorocket pack over the shield to help retain it during re-entry. After the flight, it was determined that the indicator was faulty and there was never any danger posed from a faulty heat shield. Glenn’s Friendship 7 Mercury capsule safely splashed down 800 miles South-East of Cape Canaveral after a 4 hour and 55-minute flight, well in excess of the scheduled 30 minutes. Glenn’s flight had record he endured 7.8 G’s of acceleration while traveling 75,679 miles at about 17,500 miles per hour; the flight had made John Glenn the first American to orbit the Earth. Glenn was heralded as a national hero and even received a ticker tape parade in New York City. Glenn was awarded the NASA Distinguished Service Medal from President Kennedy. JFK valued Glenn so much as symbol of America’s space ambition that he refused to allow Glenn back into space to risk his life. Later, Glenn would become close friends of the Kennedy’s who clearly recognized Glenn’s potential as a politician and future political ally. 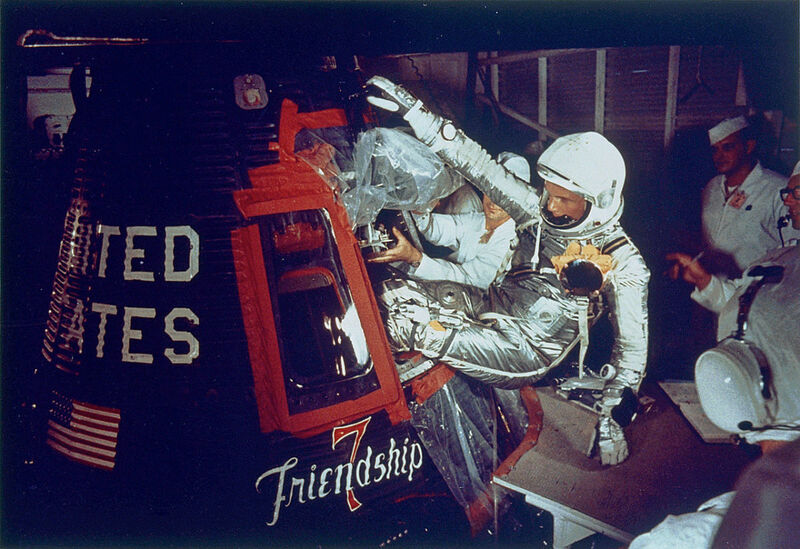 John Glenn entering Friendship 7 spacecraft. At the age of 42 Glenn was an old man by Astronaut standards of the day and was not likely to be on any future lunar missions; he would resign from NASA in January of 1964.Glenn also announced his Democratic Party candidacy for the United States Senate in his home state of Ohio on January 17, 1964. He was forced however to withdraw for the race in March because of a concussion from hitting his head against a bathtub back in February. Glenn retired as a full bird Colonel in the United States Marine Corps on January 1, 1965 and quickly became an executive with Royal Crown Cola Company. As mentioned prior, Glenn had become close to the Kennedy family and was present when Robert Kennedy was assassinated in 1968, even serving as one of pallbearers. In 1970 the Ohio seat in the US Senate was open and Glenn decided to throw his hat in the ring once again. 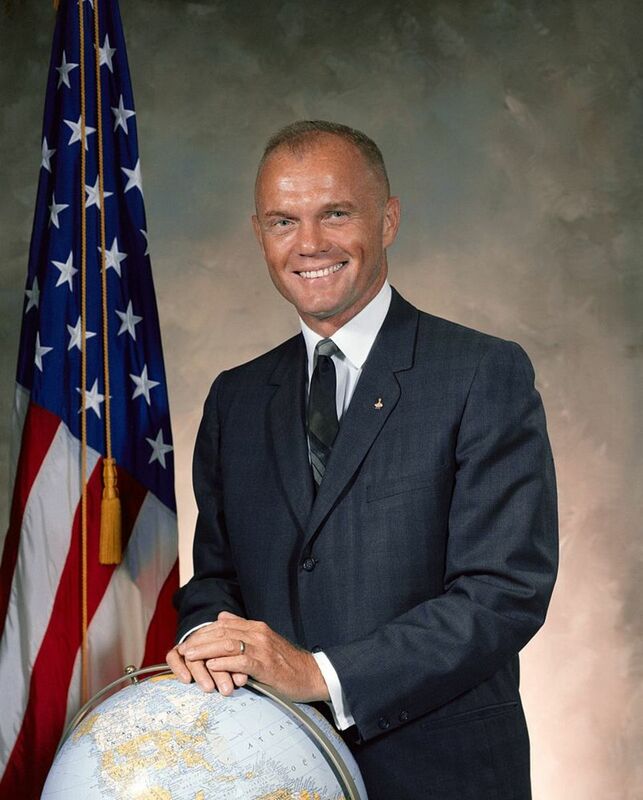 This time he completed the campaign and won; thus, igniting a Senate career for John Glenn that would last until 1999. In 1976 Glenn, had been in the running for the Vice-Presidential slot during that year’s Democratic primary but was defeated at the convention by nomination of Walter Mondale; Glenn also tried running as the Democratic Presidential candidate in 1984 but was soundly defeated. 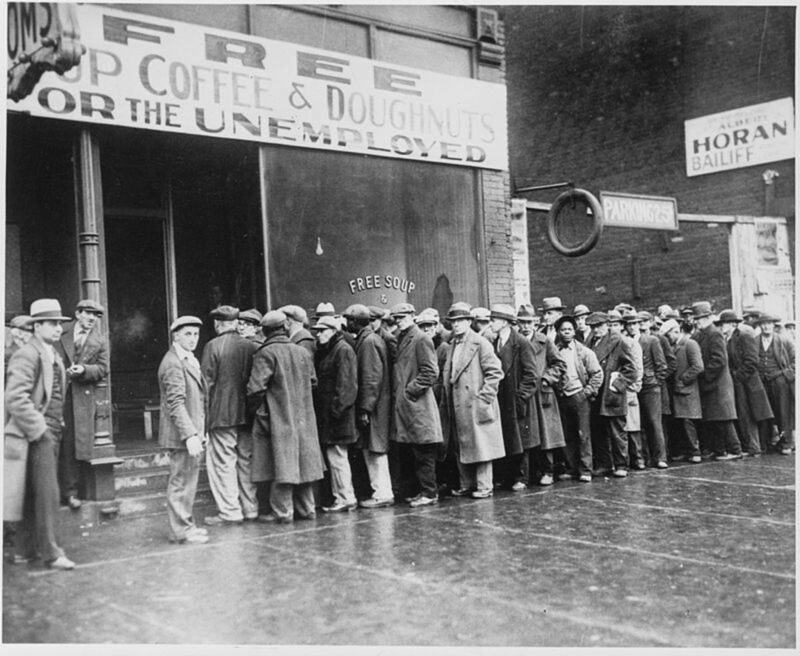 Senator Glenn would find himself caught up in the Savings and Loan scandal during the 1980’s and 1990’s. Although Glenn and John McCain were the only two of the so-called Keating Five Senators to be exonerated in the scandal, it had been determined never the less that Glenn had exercised poor judgment. As a senator, Glenn was primary author of the Nuclear Non-Proliferation Act of 1978 while he also chaired the Committee on Governmental Affairs from 1987 to 1995 and sat on the Foreign Relations and Armed Services committees as well as the Special Committee on Aging. When the Republican Party regained majority control over the Senate, Glenn was the ranking minority member on the Permanent Subcommittee on Investigations which investigated illegal foreign donations by China to United States political campaigns during the 1996 elections. John Glenn on October 29, 1998, before Space Shuttle Discovery's STS-95 flight. Glenn would have the chance to return to space in 1998 when NASA announced that John Glenn was slated to be a crewmember aboard the shuttle Discovery for the STS-95 mission. At age 77, this made Glenn the oldest person to ever travel into space. Glenn had lobbied NASA for over two years offering himself as a geriatric space study guinea pig. Glenn returned to orbit on October 29, 1998 titled as a payload specialist. While aboard Discovery, he participated in experiments involving sleep and the body’s protein use in space. Glenn had always been a family man despite his ambitions. He had been married to his wife Anna Margret Castor since 1943 and remained married to her until his death on December 8, 2016. The couple had two children, John David and Carolyn Ann as well as two grandchildren. 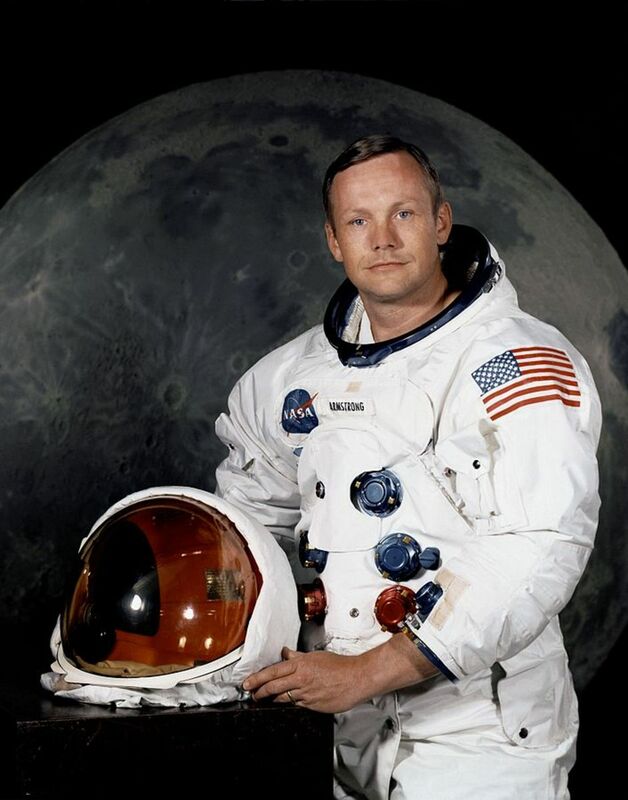 In addition to his accomplishment in space and engineering, he was a 32nd degree Scottish Rite Mason and an ordained elder in the Protestant sect Presbyterian Church. One of his final acts in the realm of space exploration and its encouragement was On April 19, 2012; Glenn participated in the ceremonial transfer of the retired Space Shuttle Discovery from NASA to the Smithsonian Institution for permanent display at the Steven F. Udvar-Hazy Center. He criticized the "unfortunate" decision to end the Space Shuttle program, saying that grounding the shuttles delayed research and human progress. In June 2014, Glenn underwent successful heart valve replacement surgery at the Cleveland Clinic. In early December 2016, he was hospitalized at the James Cancer Hospital of Ohio State University Wexner Medical Center in Columbus. Per a family source, Glenn had been in declining health for several years and his condition was grave; his wife and their children and grandchildren were at the hospital throughout his final days. Glenn died on December 8, 2016, at the OSU Wexner Medical Center; no cause of death was publicly disclosed. 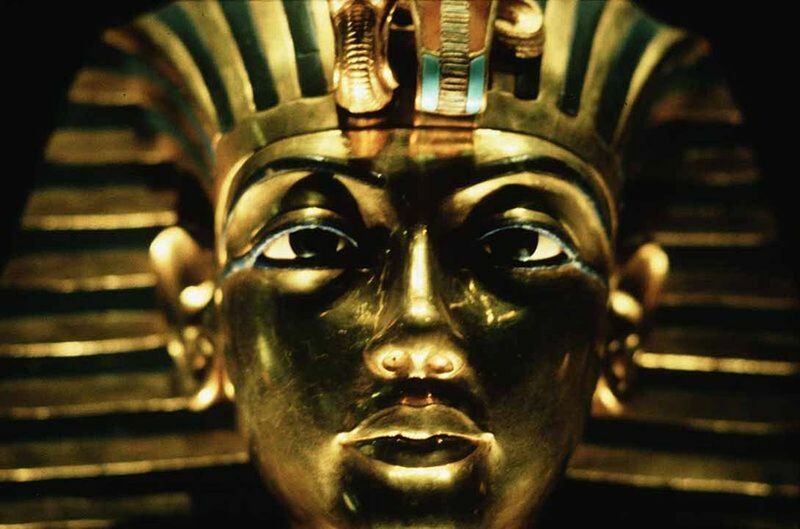 He would be interred at Arlington National Cemetery after lying in state at the Ohio Statehouse and a memorial service at Mershon Auditorium at Ohio State University. 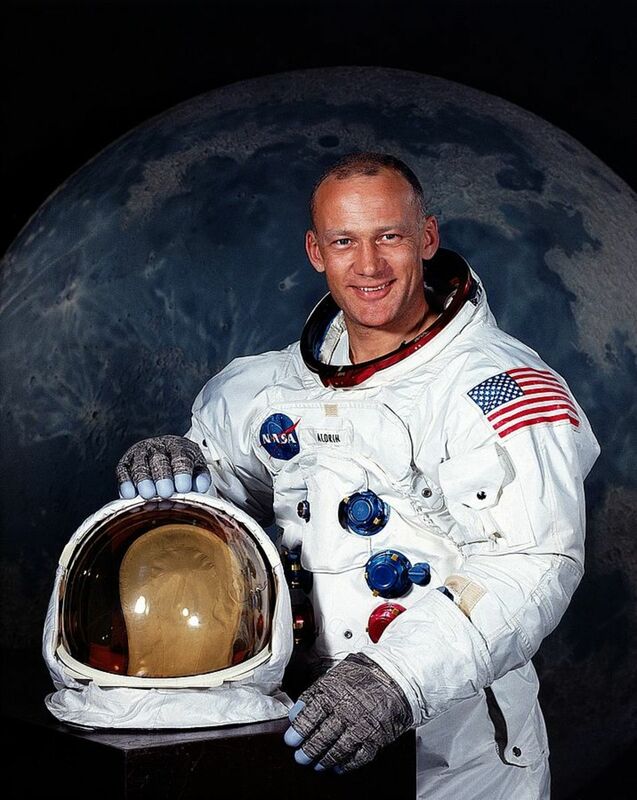 One of America’s greatest fighter pilots and astronauts now belongs to the ages. His humble manner before his many accomplishments both in the skies and on the earth, should serve to inspire current and future generations. 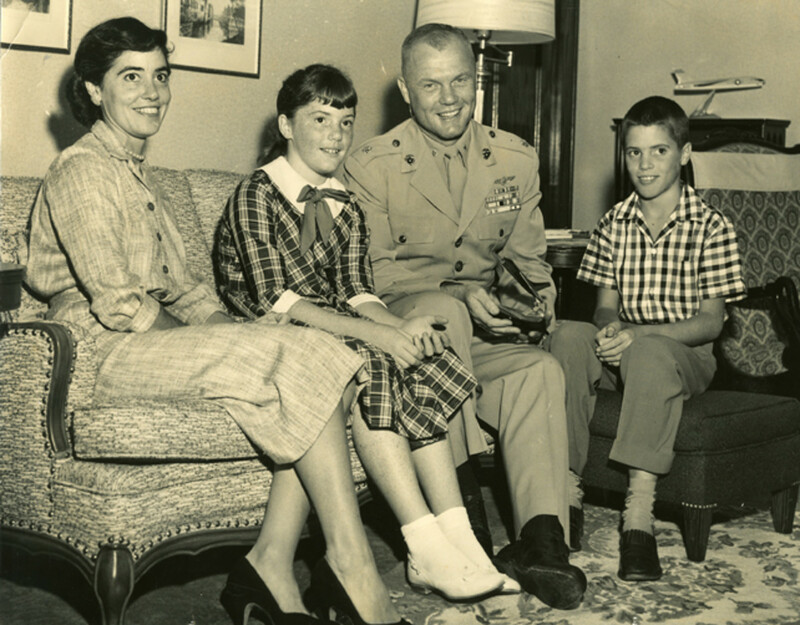 John and Annie Glenn with their two children. Glenn, J. and N. Taylor. John Glenn A Memoir. Bantam Books. 1999. Carpenter, M.S., L.G. Cooper, Jr., V.I. Grissom, W.M.Schirra, Jr., A.B. Shpard, and D.K. Slayton. 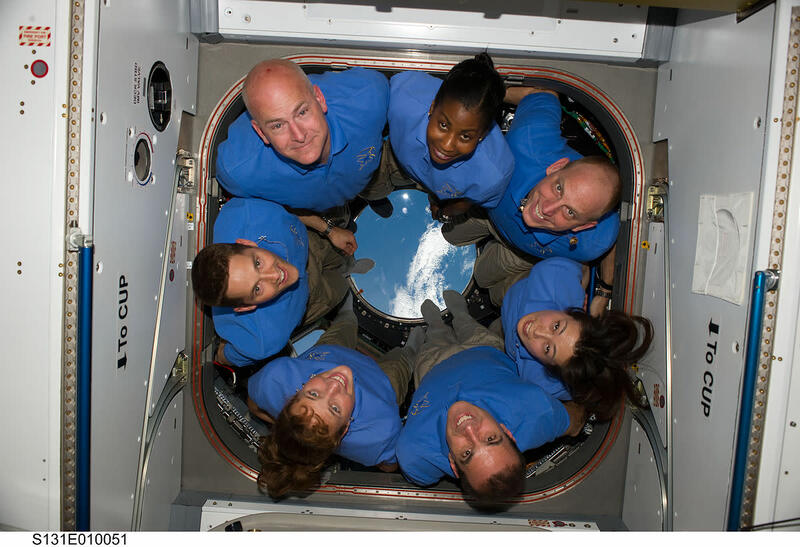 We Seven by the Astronauts Themselves. Simon and Schuster, Inc. 1962. Profile of John Glenn. https://www.nasa.gov/content/profile-of-john-glenn/ Accessed January 9, 2017. About Project Mercury. https://www.nasa.gov/mission_pages/mercury/missions/program-toc.html Accessed January 9, 2017.